1st CupcakeBirthday Boy Table Decorating Kit has a tall 3D beautiful centerpiece standing 14.5 inches and features shiny blue fringe. This centerpiece has "I'M ONE" printed on it, with a "1" shaped candle cutout on the top. There are two smaller star-shaped 3D centerpieces stand 7 inches tall, and 20 2-inch confetti pieces in circle, star, and "1" shapes. 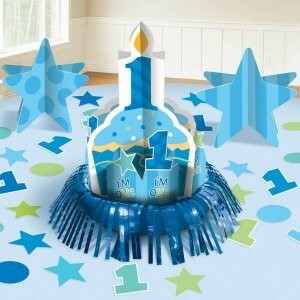 1st Cupcake Birthday Boy Table Decorating Kit has a tall 3D beautiful centerpiece standing 14.5 inches and features shiny blue fringe. This centerpiece has "I'M ONE" printed on it, with a "1" shaped candle cutout on the top.